Shyqyri Syla, Head Prosecutor of Mitrovica Basic Prosecution, confirmed for BIRN that Oliver Ivanovic died after being shot with four bullets in front of his party HQ on Tuesday morning. Two more sources confirmed Ivanovic's death. Kosovo Police didn’t issue any statements so far. Ivanovic’s lawyer, Nebojsa Vlajic, confirmed to BIRN that his client died in hospital at 9:30am. “He has been shot in the upper part of his body, and in the back, early in the morning, when he was in front of his office [in Kosovska Mitrovica],” Vlajic said. He added that the investigation by Kosovo police is ongoing, so he did not have any more information about the shooting. “I still don’t know what are our next move will be,” Vlajic said. 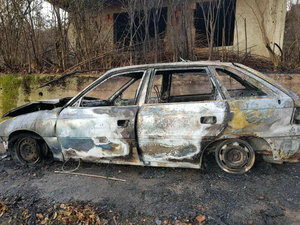 A burned car was found near the northern Kosovo settlement of Zvecan I Vogel/Mali Zvecan, which according to BIRN sources was used by Ivanovic’s assassins. Burnt car found in Mali Zvecan. Ivanovic, a former Serbian government official and head of a Kosovo Serb political party called Freedom, Democracy, Justice, was currently stranding trial for war crimes for allegedly ordering the murder of ethnic Albanians in Mitrovica in 1999. Kosovo police said in a press release that material evidence has been found at the crime scene and that the investigation into Ivanovic’s shooting is ongoing. It said that a torched Opel Astra car with no licence plates was found around 9:15am in a street in North Mitrovica, which the police suspects could be related to the murder case. The state prosecutor of the Basic Prosecution in Mitrovica has also arrived at the scene. Additionally, strict border controls have been enforced at Bernjak and Jarinje, the two border crossings between Kosovo and Serbia. The government of Kosovo condemned Ivanovic’s murder, calling it a “challenge to the rule of law and all attempts to restore order across Kosovo’s territory”. “Violence is unacceptable, no matter from where it comes and toward whom it is directed,” the government said in a press release. The government called on all citizens to cooperate with law enforcement in shedding light on the case and asked the security forces to catch the perpetrators and bring them before justice. The negotiations between Serbia and Kosovo scheduled for today have been cancelled after Oliver Ivanovic’s murder, head of Pristina’s delegation Avni Arifi told BIRN. Serbian President Aleksandar Vucic called for an urgent session of the National Security Council and will address the media at 1pm. Head of the Serbian government’s office for Kosovo, Marko Djuric, called Ivanovic’s murder a “criminal and terrorist act that must not go unpunished”. “This is an attempt to push the Serbian people in Kosovo and Metohija into chaos, this is an attack on the whole Serbian people to push into the hell of a conflict,” Djuric told media in Brussels, Beta news agency reported. He added that Serbs “were treated by war without any reaction by the international community” and that there were several attacks on property of Serbs. “Whoever stands behind this, whether Albanian or Serb criminals, must be punished,” Djuric said. The President of Kosovo, Hashim Thaci, has strongly condemned the murder of Oliver Ivanovic. 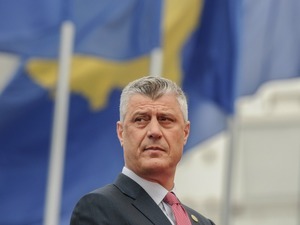 "I call on the justice authorities to expose the circumstances of his assassination as soon as possible and the perpetrators of the crime come to justice," said President Thaci. He has appealed to citizens of all communities in the north of the country to cooperate with the justice authorities. The European Union has sharply condemned the murder of Kosovo Serb politician Oliver Ivanovic in Mitrovica this morning and expressed condolences to his family, said the EU spokesperson for foreign policy and security Maja Kocijancic. She added that the EU rule of law mission in Kosovo, EULEX, will support the local authorities in accordance with its mandate and called for “calm and restraint”. “I am in complete shock, I just cannot speak at the moment,” Dragisa Milovic, Oliver Ivanovic’s close co-worker and SDP party official, told BIRN after news of the Kosovo Serb leader’s murder this morning surfaced. The leader of Serbia’s opposition Enough Is Enough movement, Sasa Radulovic, said on Twitter that he expects the arrest of those who committed and ordered the murder of Oliver Ivanovic. “The power in Belgrade and Kosovska Mitrovica is in the hands of the [ruling] Serbian Progressive Party. In Pristina [PM Ramush] Haradinaj rules with support of the Progressive Party. Keep your words to yourselves. [We want] only action,” Radulovic said. Serbian citizens are organising a commemoration for Oliver Ivanovic in front of the St Sava temple in Serbia’s capital, Belgrade, tonight at 7pm. People have been sharing the invitation to the event on social media. Head of the UN Mission in Kosovo, Zahir Tanin, said that he was shocked by the murder of Oliver Ivanovic near his office in North Mitrovica this morning, and strongly condemned the act. Tanin said that he trusts the investigative authorities will work swiftly and effectively, and gave his assurance that all international agencies on the ground are ready to support the authorities in any manner that would help to swiftly apprehend those responsible for Ivanovic’s death. “I extend my own and the entire UN family’s deepest condolences to the family and friends of Mr. Ivanovic”, Tanin stated. The Head of the OSCE Mission in Kosovo, Ambassador Jan Braathu, expressed his shock and deep sadness at the murder of Oliver Ivanovic in Mitrovica today. “Oliver Ivanović’s murder is profoundly distressing,” he added. “I have had the privilege of knowing him personally over the years and have always admired his intellect, composure, and commitment. To see that a politician can be murdered in cold-blood in 2018 in Kosovo is a devastating thought. He condemned the “heinous act” and urged law enforcement to do all they can to bring those responsible to justice. “This will be a major test for rule of law in Kosovo,” he said. The President of Bosnia’s Serb-dominated entity Republika Srpska, Milorad Dodik, said that Ivanovic’s murder is a “classic assault on stability of Serbia and north Kosovo”. According to Fena news agency, Dodik said the shooting is an “assault on efforts of Serbian authorities which gave their immeasurable contribution to hard work on building peace and trust among people in Kosovo”. Dodik expressed his “full support to the institutions of Serbia” in finding of those responsible for the crime. The President of Serbia’s opposition Democratic Party, Dragan Sutanovac, expressed condolences to the family of Oliver Ivanovic, whom he called a man of “cooperation and tolerance”. “Oliver was a man of peace. He will be remembered as one,” Sutanovac wrote on Twitter, saying that the bullets that killed Ivanovic came “from the world of the past”. 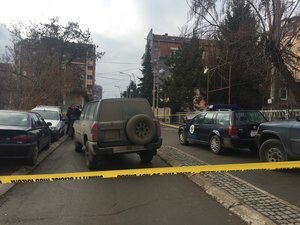 EU foreign policy chief Federica Mogherini spoke by phone to the presidents of Serbia and Kosovo, Aleksandar Vucic of Serbia and Hashim Thaci respectively, following the killing of Oliver Ivanovic in North Mitrovica this morning. The official press release states that the Mogherini strongly condemns Ivanovic’s murder and expressed condolences to his family and friends. She underlined the expectation that the relevant authorities will spare no effort to find the perpetrators and bring them to justice without delay. She added that the EU’s rule of law mission in Kosovo, EULEX, will support the authorities in accordance with its mandate. 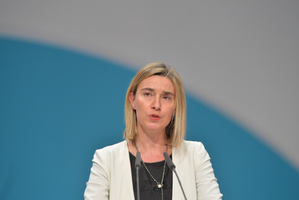 Mogherini also called on all sides to show calm and restraint and allow the rule of law and justice to take its course. “We urge all sides to avoid dangerous rhetoric and remain calm at this sensitive time, and recommit themselves to continue to work towards the normalization of relations and improvement of the lives of the citizens of Kosovo and Serbia,” reads Delawie’s statement. Head of the EU’s Delegation in Serbia, Sem Fabrizi, called on all parties to remain calm after the murder of Kosovo Serb politician Oliver Ivanovic. “The EU is calling on all authorities in Kosovo not to hesitate and invest all efforts to bring the perpetrators to justice,” Fabrizi said. The Serb mayor of North Mitrovica, Goran Rakic, said that the shooting of Oliver Ivanovic is a “shot in any Serb which refused to leave the homeland”. “A cowardly attack that ended his life has deeply shaken all Serbs in Kosovo and calls for the most urgent reaction of all security services,” Rakic said in a written statement. He added that the US State Department warned a few days ago about potential violence in North Kosovo and asked why no one had reacted. 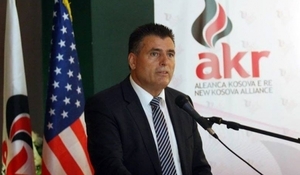 “I demand that Kosovo Police together with [NATO’s Kosovo peacekeeping force] KFOR and [the EU's rule-of-law mission in Kosovo] EULEX as soon as possible find out who did this crime and to guarantee citizens’ safety…,” Rakic added. He also called for citizens to remain calm. The Speaker of the Kosovo Assembly, Kadri Veseli, has also denounced the murder Oliver Ivanovic, the head of the Kosovo Serb political party Freedom, Democracy, Justice. Veseli said that he believes that justice institutions will undertake all necessary measures to shed light to this crime, and bring the perpetrators before justice soon. Kosovo’s deputy Prime Minister, Enver Hoxhaj, expressed via Twitter his strong condemnation of this morning’s murder of Oliver Ivanovic in northern Mitrovica, Kosovo. He tweeted that law enforcement agencies are investigating the case with utmost urgency, and that “to avoid political manipulation”, responsible actors should be brought to justice as soon as possible. "While the motives and actors [in Ivanovic’s murder] are still unknown, it is worrisome to see such impulsive and destructive reactions of Serbian authorities who are openly threatening to destabilise the situation and to derail the normalisation process [between Serbia and Kosovo]." Albania’s Prime Minister, Edi Rama, called the assassination of Ivanovic an ill-intentioned act that “incites hatred and tension”. "Efforts for dialogue and peace should not be stopped! Those have to be deepened!” he wrote on Facebook. Montenegro opposition party, Democratic Front, DF, has strongly denounced the murder of Oliver Ivanovic and asked all competent institutions of Serbia and representatives of the international community in Kosovo to investigate the crime. The DF said in a press release that the incident is directly targeted against peace and stability of the entire region. “Oliver Ivanovic was an example of a true patriot and a man who devoted his entire life to the struggle for Serbia and the Serbian people in Kosovo and Metohija. Oliver was our honest friend,” the press release reads. DF added that if it wasn’t for Ivanovic, “the north of Kosovo would be ethnically clean”. Serbian news agency Beta has reported that the autopsy of Oliver Ivanovic’s body will be performed in Mitrovica in Kosovo today at around 2pm. “We demand that the police react and arrest the perpetrators of this terrorist act. The most important thing is preservation of peace in Kosovo,” Dacic added, Beta news agency reported. 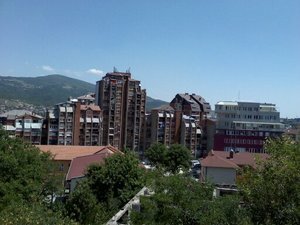 Serbia has requested to participate in the investigation of Oliver Ivanovic’s murder in Kosovo, and will conduct a parallel investigation of its own, Serbian President Aleksandar Vucic announced at a press conference after an urgent meeting with the National Security Council following Ivanovic’s assassination this morning. “For Serbia this is an act of terrorism and we will treat it accordingly,” Vucic told the press, adding that the Council has sent an explicit request to the EU’s rule-of-law mission in Kosovo, EULEX, and the United Nation’s Mission in Kosovo, UNMIK, for Serbian authorities to participate in the investigation in Kosovo. “We are assured that the participation of Serbian authorities would guarantee the apprehension of Oliver Ivanovic’s killers,” Vucic said, and insisted that the perpetrators will be identified. He also stated that the organized crime prosecutor will launch an investigation today and file a request to the Serbian police and Security and Information Agency to gather information on the case. 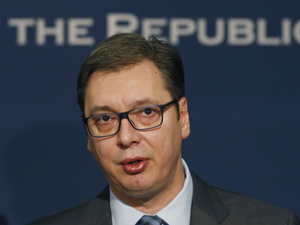 “I am assured that this attack, no matter who did it – Serb, Albanian or foreigner – is an attack on Ivanovic’s family, the north of Kosovo, and Serbs altogether,” Vucic said. Asked about the political attacks on Ivanovic by his party’s rival, Belgrade-supported Srpska Lista [Serbian List], Vucic said that there is no evidence to say that the murder was a political assassination. 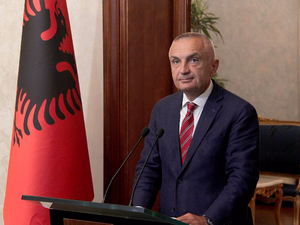 Following Ivanovic’s murder, Albania’s President, Ilir Meta, said he believes that the relevant authorities would shed light on the crime as soon as possible and bring the perpetrators to justice. Shyqri Syla, head prosecutor of the Mitrovica Basic Prosecution, told BIRN that the autopsy of Oliver Ivanovic will be done by Kosovo’s Forensic Department. Syla did not specify if Ivanovic’s body will be sent to Pristina or if the autopsy will be conducted in North Mitrovica, where the murder occurred this morning. However, he did confirm that the forensics crew is already in Mitrovica. 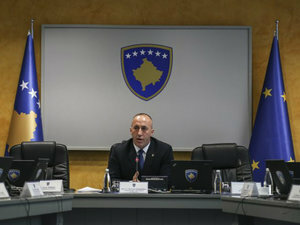 Kosovo’s PM Ramush Haradinaj has called a meeting of the National Security Council for 6pm today, but government spokesperson Donjeta Gashi told BIRN that it will be a normal gathering. “The meeting is regular and it has to do with the general security situation in the country,” Gashi said. President of Serbia’s opposition Democratic Party, Dragan Sutanovac, called Ivanovic’s murder “the first political assassination in Serbia” in 15 years, saying that the victim had faced many threats in the past. “Many have painted a target on Oliver Ivanovic’s back in the past. This was a shot at peace,” Sutanovac said during a press conference in Belgrade, mentioning both the accusations of war crimes and political attacks from rival Serb politicians. “Oliver Ivanovic faced a plethora of threats in the past, his car was set on fire, and he lived practically under siege,” Sutanovac said, questioning why Ivanovic was not given security. Previously, Serbian President Aleksandar Vucic stated that the Serbian authorities had “no knowledge” of direct threats against Ivanovic. Kosovo Police is appealing to citizens who may have any knowledge about Ivanovic’s murder to assist with information that may help find the perpetrators. They are offering a reward of 10,000 euros for any citizen who can give information that leads to the solving of the case. 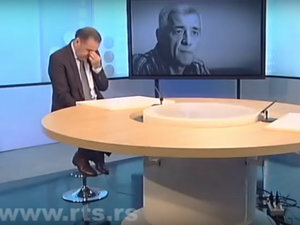 Serbian Deputy PM Rasim Ljajic broke into tears as he talked about the murder of Oliver Ivanovic during an interview for the Serbian national broadcaster RTS this afternoon. He said that he will remember Ivanovic as “the bet Serb politician from Kosovo”, a moderate who understood politics and who advocated for compromise. “He understood the situation perfectly and wanted to change it in a democratic way, and that is the difference between Oliver and everyone else,” Ljajic said in the interview. He added that it would be a “great disgrace” if the murder case is not solved, but added that he does not believe that the perpetrators will be found. Shyqri Syla, head prosecutor of Mitrovica Basic Prosecution, told BIRN that two prosecutors are working on Ivanovic’s murder. “The murder of Oliver Ivanovic is being investigated by a team of two prosecutors of our prosecution, Nijazi Rexha and Jova Radovic,” Syla told BIRN. He added that there is not any suspect identified yet. The Association of Expelled Serbs from Djakovica called the murder of Oliver Ivanovic a “shot at peace and tolerance”, and warned that there is no future in hatred and threats. “Oliver devoted his energy and whole life to peace and tolerance, that is why it is so hard to accept our friend’s death,” the Association said in a press release. President of the Free Citizens’ Movement and former Serbian Ombudsman Sasa Jankovic commented on Ivanovic’s murder by saying that some media and politicians “draw targets on peoples’ foreheads”. “[Director of the Serbian government’s office for Kosovo] Marko Djuric said that Ivanovic was ‘pathologically enamoured with himself” and that he had a “paranoid belief that someone is threatening him,” Jankovic said during a press conference today. He added that Ivanovic stayed in Kosovo “when it was the hardest” and participated in elections believing that Serbs should have a dignified life. Oliver Ivanovic will be buried in Belgrade on Wednesday or Thursday, Ksenija Bozovic from Ivanovic’s Freedom, Democracy, Justice political party said. Bozovic told Beta news agency that before his burial, citizens will be able to pay tribute to Ivanovic in the party’s headquarters in Mitrovica, where his body will be exhibited. The Serbian Prosecutor’s Office for Organised Crime announced that it has launched an investigation into the murder of Oliver Ivanovic from the perspective of it being an act of terrorism. The Office said in a press release that the prosecutors held a meeting with representatives of the Interior Ministry and the Security and Information Agency and filed requests to gather relevant information. Serbian President Aleksandar Vucic said earlier today that Serbia will conduct its own parallel investigation of the murder, as well as request to participate in the investigation in Kosovo. The mayor of the Mitrovica South municipality, Agim Bahtiri, wrote on Facebook that he met with Kosovo’s Minister of Internal Affairs, Flamur Sefaj, to ask him to ensure justice authorities made Ivanovic’s murder case a priority. In his post, he also called on citizens to remain calm, “as we need stability in these moments more than ever. OSCE Chairperson-in-Office, Italy’s Angelino Alfano, and the OSCE’s Secretary General, Thomas Greminger, expressed shock and outrage over today’s murder of Oliver Ivanovic, offering their condolences to his family and friends. “We are shocked by the murder of Oliver Ivanovic. We condemn it in the strongest possible terms and we ask that a swift and thorough investigation shall be conducted immediately in order to identify those responsible for such a heinous crime,” they said in a press release.